dinEvery Thursday in May, the headlining show at The Hideout Theatre is History Under the Influence. The premise of this show is simple enough: a narrator, played formidably by Austin improv veteran Mr. Kevin Miller, spends the afternoon getting drunk on whisky and beer, and then he describes a historical event or two. A team of improvisers, all of them stone cold sober, then act out Mr. Miller’s inebriated story. It should be noted here that Mr. Miller is not an expert on history. He works for Apple. But he is imaginative and he is drunk—and what else does a show called History Under the Influence need than that? Thank you for meeting me, Mr. Miller. So what sparked your interest in history? Ah. And why is that? It’s about people, and things that happen to people, and places where happen. But why an improvised Drunk History show? Other people like history. Or drinks. Both. It’s for everybody. And improv! It’s for everybody! Is there anything people show know before they come? We go on third. So the first people will not be drunk probably. And the cast isn’t drunk. I got all the drunk. It’s fun. And you walk us through a historical event? Yes it’s accurate. Well last week I got the date of the Louisiana Purchase right. And there were Indians and white people were racist to them, so that’s accurate. Other stuff we make up cause it’s improv and that’s it. Do you have a favorite period in history you’d like the shows to cover? Chinese Wall. Great Wall of China, I mean. But that would probably be racist. Last week was racist too. History is pretty racist now that I’m talkin about it. So maybe a happy story. Peasants and the pole that you go around with the flaps. Maypole! Your knowledge of history is clearly encyclopedic. Do you consider yourself an authority on history? I was a liberal arts major so yes. History. Anthropology. Trivia. Science. Bourbon. Science of people. I dunno, I know about history! …done any historical research for the show? Have you looked into history for the show? Mr. Miller, did you do any research for the show? I like beer. Beer. Yes I looked up history research. Like stories. Five bucks. The show is five bucks. In May. Thursdays in May the show is five bucks. I’m gonna go this is the wrong beer. What does the wrong beer mean? 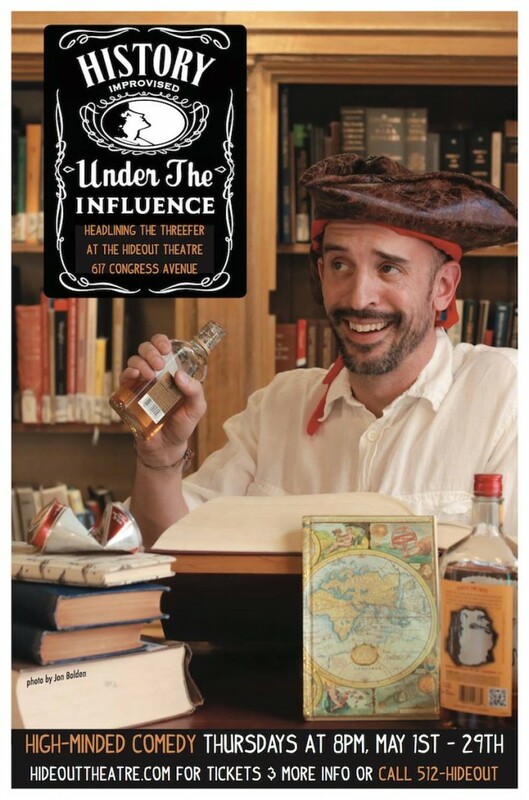 History Under the Influence plays every Thursday in May at The Hideout Theatre in downtown Austin. Click here for more info and tickets.